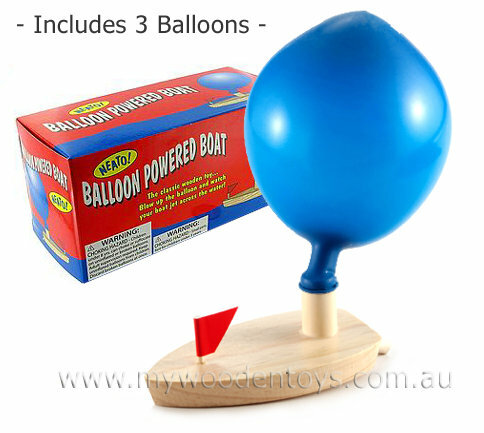 Balloon Powered Wooden Boat is a fun educational toy that is great at bath time or in the pool. This little boat works by placing a balloon over the funnel and then blowing it up via the tailpipe at the back. With your finger over the tailpipe you place the boat in the water and let go. As the balloon deflates the boat putt putts around the bath leaving a trail of bubbles... Fantastic !! This is one of our personal favorites and is a huge amount of fun and teaches one of the basics of Physics whilst your in the bath. This little boat comes with 3 balloons and will be a firm favorite come bath time. Material: Wood with Child Safe Varnish. 4 Rubber balloon. felt flag. We like this because: "like all great toys it is incredibly simple and is great to play with again and again."